This is a sit-down-and-pay-attention movie. The story is complex enough that if you don't already know something about WWII codebreaking, you probably shouldn't even blink. But stay with it and you'll be richly rewarded. It's important that you buy or rent the Special Edition DVD of this film because the original DVD release has no extras and one of the worst digital transfers I've ever seen. Having said that, Columbia Home Video tries to make up for it on this second go-round. The film looks gorgeous and the sound is very crisp (which is good because the score is wonderful). Two accompanying featurettes (one on the filmmaking and the other on the real codebreaking the film depicts) are rather standard interview-the-cast fare, but interesting if you become as engrossed by the film as I did. The same is true of director Apted's commentary, in which he speaks of the historically accurate details, the historical context (i.e. the incredible luck of the Allies' acquiring an Enigma machine when they did) and about the real Bletchley Park and life there. My only complaint: There's no commentary on the deleted scenes, which really need it because had they been in the film, the ending would have been significantly altered. Apted covers these changes on the feature commentary (between test screenings and the advice of the book's author they made changes to preserve some of the mystery), but if you watch the deleted scenes without having listened to the commentary track, you'll be left wondering what went on in post-production for such drastic changes. On the Special Edition, both are excellent. But beware the earlier DVD release! An intensely intellectual and emotional World War II spy story about British codebreakers, Michael Apted's "Enigma" requires a viewer's complete focus to follow its intricate, twist-packed story of intrigue, obsession and romance. But those who keep up will find the plot rewards your intelligence, the performances are extraordinary and the characters engrossingly mysterious. The film takes place almost entirely at Bletchley Park -- England's massive, top secret base for intercepting and deciphering Nazi radio traffic -- in the days leading up to a German U-boat attack on a massive Allied convoy in 1943. Dougray Scott ("Mission Impossible 2," "Ever After") stars as Tom Jericho, a code-cracking mathematician who was "pulled out of Cambridge of the first day of the war and worked to the breaking point." As the film begins, the man is a haggard, unshaven wreck who has been dragged back into the fold by bosses who hate him because they need him desperately. The Germans have switched codes and as a result the British have lost track of the largest submarine wolf pack they've ever encountered. But while everyone at Bletchley thinks Jericho worked himself to near-exhaustion, there's a secret service agent on base knows the truth: Jericho's breakdown was because of a girl. In flashbacks of several months before, we see a crisp, jaunty gentleman Jericho -- a handsome, tweed-suited academic who is one of the most valuable minds of the war effort. The designer of a code-breaking early computer (which takes up the entire basement of a building), if it weren't for him the base's Enigma machine -- a complex German cipher communicator captured from a sinking sub -- wouldn't be of much use. But in these scenes of better times we also see Jericho becoming uncontrollably infatuated with a stunningly beautiful, suspiciously secretive base file clerk named Claire (Saffron Burrows, "Time Code") -- who not only broke his heart and his will, but soon thereafter disappeared without a trace. The secret service agent -- played with sly, intimidating confidence and polite, brilliantly subtle menace by Jeremy Northam ("Gosford Park," "An Ideal Husband") -- thinks there's a turncoat in Bletchley Park's ranks, and he has his eye on Jericho. 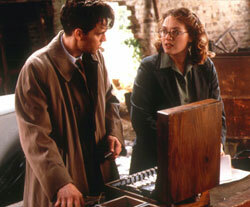 To save his skin and to protect Claire, who he discovers was most definitely up to something (she had undeciphered intercepts hidden in her bedroom), Jericho persuades the girl's bookish housemate and co-worker Hester (Kate Winslet) to help him launch a clandestine investigation of their own. As they risk their lives by smuggling off the base other intentionally undeciphered messages and the Enigma, the pair discovers what looks like a high-reaching conspiracy. And they also start becoming attracted to each other. Blessed with the deliciously luxurious dialogue and dexterous plot juggling of screenwriter Tom Stoppard ("Shakespeare In Love"), "Enigma" is an impressively elaborate web of intrigue, frazzled emotion and palpable wartime tension. One of the film's best scenes takes place in a situation room when the codebreakers and their military bosses realize they may not crack the new German cipher in time to save the convoy. A passionate debate breaks out over sacrificing one supply ship so they can intercept one more broadcast from the wolf pack and get more code to work with. "Enigma" has only two consequential problems, one of which is minor but has to do with the finale, so I won't expose it here. The other is this: If you do keep up with the story, which has manifold twists yet to come, you may find yourself second guessing Jericho, wondering if it wouldn't have been easier just to tell somebody what he knows. Just keep in mind he's "the one who got himself f**ked into a nervous breakdown by a missing blonde," as Northam puts it in a particularly intimidating moment, so perhaps he's just not thinking straight.